Bream is the most common fish among fishing enthusiasts. It can be found throughout the country in many reservoirs. The most common fish weighing up to 3 kg. But sometimes, there are instances in excess of 5 kg. The bream fishing in July on the feeder in comparison with the previous months becomes more difficult. Hot July weather dictates certain conditions of supply of bream during the day. So the larger specimens of bream caught better after sunset with a break from midnight to 2-3 and the pre-dawn hours. Bream belongs to the carp family. Catch it all year round. The body is wide and squashed on the sides. The body color is different in each pond, but the basic figures are the same for all fish. It depends on the quality of water, feed, and environmental protection. Most individuals adapt to the color of the environment for camouflage. This process involved hormones. The main part of the color bream receives upon reaching maturity. During mating and spawning, the color becomes bright, the color becomes more intense. This is most pronounced in males. The deficiency of food or disease, the color fades, becoming lighter. Habitat also affects the color of the fish. In the South in the warm waters of the color more vivid and saturated. At the sides of young and healthy individuals scales are gray with a silvery sheen, fins light grey. In Mature specimens the color is more dark and has a bronze or yellow color, and the fins are dark grey and from a distance might seem black. Medium size head, small eyes and mouth, narrow and high dorsal fin. Well-developed tail, but his bottom fin is slightly longer than the top. Large specimens have a wide body and matching small head, which creates a transition that looks like a hump. From the side view you can see the curve of the back is absent in other species of fish. It is possible to distinguish the bream caught from other instances. Young skimmers do not yet have such a hump, and it can be mistaken for white bream or white-eye. 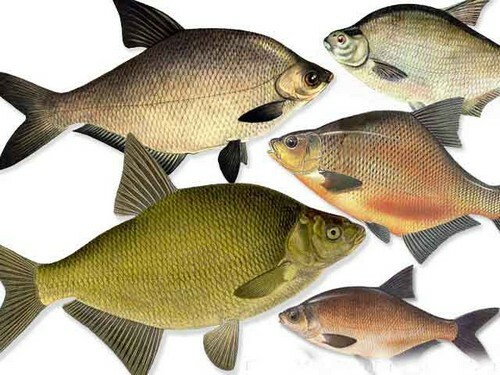 These species are relatives of bream, but their dimensions do not exceed more than 30 cm. In different reservoirs bream in July, prefers to be in places that may differ materially. But they have one thing in common, these places have large depths. In the summer the rivers the bream likes to be at a depth in a relaxed environment (the river don). For prefers slow, the bottom with large areas of silt or sand. This is mainly a backwater near a cliff, or bends with opposite currents and small whirlpools. Search mining in these areas can show good results and increase the chances of catching large specimens. 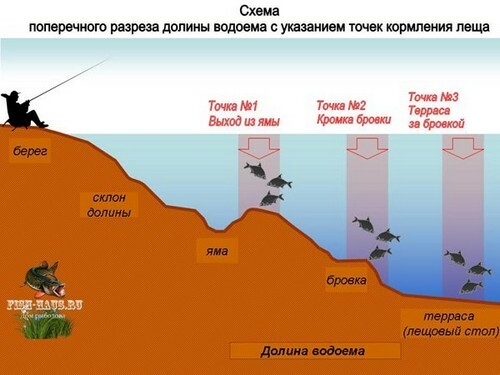 In separate ponds or lakes with standing water fish choose areas with presence of vegetation, the great depth or the pit (the river of Siversky Donets). When eating plants from bream you can hear sounds reminiscent of “Champ”. This they often find themselves. Shoals of bream can be located under the steep Bank, avoiding the bottom with a rocky bottom or large accumulations of shells. If we managed to catch a bream or an adult, then there is the whole flock. Looking for food bream performs small attacks, but can often return to favorite places more than once. If you managed to find such a place, it is possible to catch bream. In the reservoirs (fishing for zemlyanska areser.) they prefer to be near steep cliffs, or go to quiet areas to search for food. Above the dam you can find a large amount of food, which often feeds on lots of fish. In most waters the bream prefer to be at a considerable distance from the coast (Karelia). But in the morning or in the evening they move closer to shore to search for food. The abundance of bubbles in the water near the shore may indicate the location of the joint. In large bodies of water at night in July bream can go in shallow areas and swim near the surface. It gives a rare appearance of the fins on the water surface or bubbles on the water. At the completion of splashing on the surface of bream mixed in depth. Spawning bream passed? And when?! 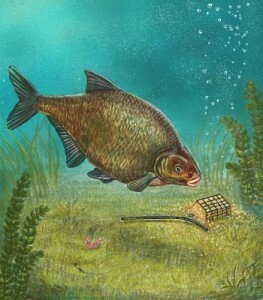 Bream starts to go to spawn before the majority of fish. To spawning they start to leave in late winter or spring. This occurs together with abundant Joram and the chance to catch bream to become higher. The fish is waiting, when the water temperature rises to normal and begins to actively look for a place to spawn. Start mating and fighting over females. The prize goes to the largest individuals. Fish at this time is divided into age categories, in which individuals of equal size. For spawning females prefer places where the water is only during the spring flood. Basically it is a flooded valley or the meadows. Locations can be in another place, but they must be vegetation. It’s fallen trees, reeds, reeds and other plants which will keep the caviar. The diet of bream in July depends on the age. The juveniles prefer small larvae. 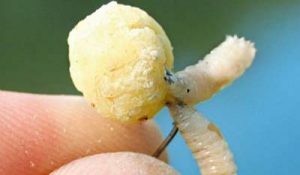 Adults moving to a larger food: bloodworms, mussels, caddisflies. If necessary, food can be consumed spawn of the neighboring fish. Mainly bream to eat the eggs of pike, and sometimes perch. English Donka or feeder became very popular with the angler when fishing for bream. Feeder will allow you to throw the bait at a considerable distance up to 80 meters with simultaneous bait. Common “loop-the-Gardner” or the so-called paternoster. On the water with a strong current, you can apply the spiral feeder, which retains a diverse diet. Bream is cautious and prefers to grab the bait only after a bit of sucking. If he smells danger, he immediately spit out the bait and disappear at depth. 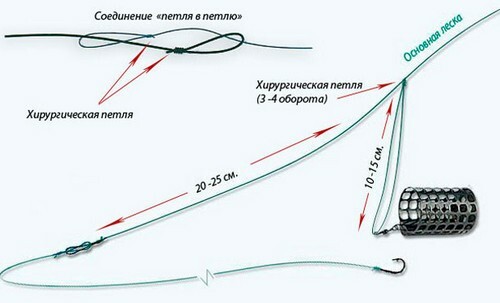 Feeder form: for a good throw you will need a long pole from 3.6 to 4.2 meters. Class Blanca Medium or higher, and the dough is from 50, but of course depending on the type of water and its flow. The usual feeder rod has three brightly colored replaceable vershinki different hardness. The soft is designed for fishing on low flow, medium – fishing on the middle reaches, and hard tip of the rod is designed for fishing in the fast current. Reel size 3000-4000 on Szymanowski classification with a ratio of from 4:1 to 5:1 . Feeder reel with beltranena will not be superfluous. The main fishing line braided section diameter of 0.16 to 0.22 mm. the leader for the feeder make the calculation of the 3 lengths are used of the form of feeder. Lead feeder choose not shorter than 30 centimeters. The material for a leash of suitable mono-fishing line and fluorocarbon. The hook depends on the weight of the production and use of baits and accessories from No14 to No8. During the games, a bream with a lure tip feeder Blanca will remain in a relaxed position. The lure does not resist, and the fish swallows it easily and takes away. For quivertip feeder should be watched closely so as not to miss the moment of take. Now the producers of bait try rather to consider the preferences of fish, and so, having bought a couple of packets, it is possible to go fishing. Tip! In Warm water all carp, and bream love sweet flavors: honey, raspberry, strawberry, tyuti-fruti, etc. Herbal ingredients in the bait only complement it and increase the efficiency of fishing. Pour into a saucepan three cups of water to boil, add pearl barley, stir and simmer until the swelling. Add wheat flour, add butter and vanilla. Simmer this mess until the millet will absorb most of the water (on the surface appear holes, which would be bubbling like boiling water). After turning off the stove and cover the porridge with the lid on for half an hour, until the millet will absorb the remaining water. Next, we need to shift the mess into a clean dry container, add barley, corn grits and semolina and mix well. Viscosity — wash (on the river) from the feeder within 1 minute not more. In lake and reservoir disintegrate when submerged (depending on depth). Added to ready prikormku used nozzles and bait. You can increase the length of the leash at a bad biting. The bream fishing on the feeder is relatively complicated. But even a beginner after training will be able to catch a decent copy. Just need to practice more and listen to the advice of experienced fishermen. The lower Moscow river. Another fishing trip on the Moscow river, was planned and implemented, team fishing club, “White lake”, the club Chairman, father Roman — rector of “All saints resplendent in the Russian land” of the village. Beloozersk. Fishing remained as always happy and will go again, because the time spent fishing, the expense of living is not! The goal of this night fishing ball fishing for bream, try to catch bream at night and at the same time to test the installation for feeder fishing called running feeder rig. Night biting bream began as soon as it got dark and continued with few interruptions until 7 am, then the bite resumed around 8 in the morning and before dinner. The bream fishing was very productive, everyone planned to do, catch a decent number of large bream on the feeder. In the near future, will definitely re departure on the pond… have a nice view.